Add, Track, and Grow. Streamlining Your AR Process. 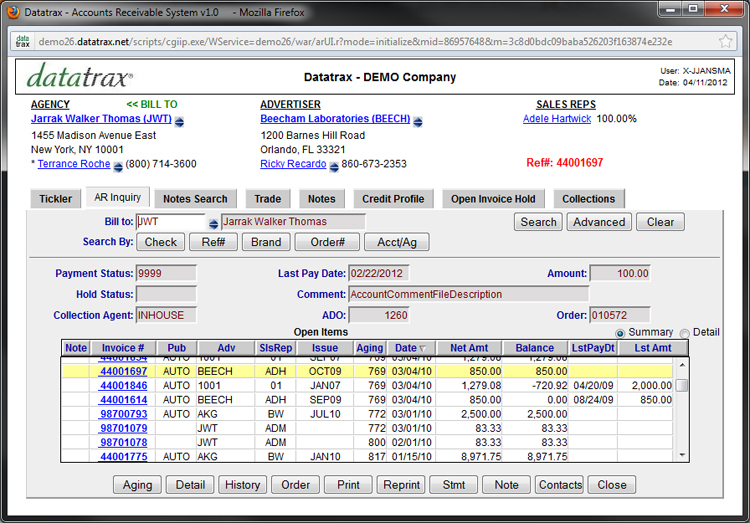 Datatrax® Accounting and A/R capabilities include: Advertiser account inquiries: by client name, invoice number, check number or pick list; a full service billing system including invoices and statements; cash receipts, discounts and adjustment processing; tracking net/gross dollars and pages-booked and billed by Issue or Advertiser contact; and rate card analysis-to name a few. Datatrax® also features a variety of standardized reports which have a matrix of user-defined sort options available. Accounting and A/R reports provide management the tools to audit current and historical sales revenues, as well as forecasting future trends. These reports include: Aged Trial Balance, A/R Ranking, Cash Receipts Aging and Sales Reports, as well as other analysis reports. Advertiser billing items may be added during order entry "on the fly"